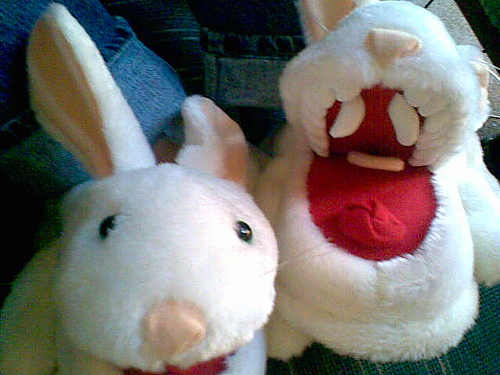 Every once in a while, pure awesomeness occurs that forces me to set my writer’s pen aside and just be the card-holding, vampire bunny slipper wearin’, geek fangirl that I truly am. Once in a while happened last week with the announcement of the Morganville Kickstarter project. For those of you that haven’t heard of the Morganville Vampire series, you should slap the back of your hand for being so clueless, then you should use said hand to immediately order the first in the series, Glass Houses by Rachel Caine. This order comes with the following warning. It took me weeks to get past the first chapter. Claire, the protagonist, is beaten, bullied, ridiculed, AND her laundry’s stolen. Who wants to read that? I didn’t. I hate it when girls are portrayed as weak. However, thankfully, a friend told me that it gets better after that first chapter so I persevered, and found that “gets better” was a vast understatement. I will be forever grateful because these are some of the best books I’ve read. So yeah, the Morganville series is great, but last week…last week…okay, I’m getting too excited just thinking about it…might as well just spit it out. Last week, author Rachel Caine announced that she has teamed up with director/producer Blake Calhoun to develop a web series based on the novels. Yeah, I know!! They’ve gone to Kickstarter to put the project before the fans for funding in the hope that they can start shooting in the Fall. There are many levels with some really cool perks for investors. Funding will close after July 11, 2013. http://www.kickstarter.com/projects/2059515068/morganville-the-web-tv-series. Click on the Web Series Funding Now banner at the top of this post to learn more. Oh, and did I tell you that they already got a commitment for the vampire Amelie, the deadly quiet and always poised “Founder” of Morganville. It’s Buffy alum Amber Benson. Tara from Buffy for cryin’ out loud. Yeah, I know!! Love, Love Love your sparkling and energetic style in this blog!